he will sit upon his glorious throne, and all the nations will be assembled before him. " 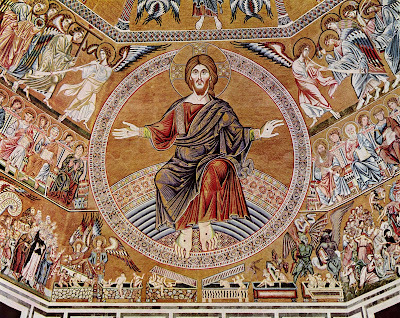 I have been struck fresh this year the beauty of the juxtaposition of the final Sunday of the liturgical calendar being Christ the King Sunday and the first Sunday of the liturgical year being the beginning of Advent. I knew the Sundays existed, I just hadn't yet in my short time following the Church calendar laid them side by side. It's a marvelous commencement. "The kingdom of the world has become the kingdom of our Lord and of his Christ, and he shall reign forever and ever." 31 "When the Son of Man comes in his glory, and all the angels with him, then he will sit on his glorious throne. 32Before him will be gathered all the nations, and he will separate people one from another as a shepherd separates the sheep from the goats. 33And he will place the sheep on his right, but the goats on the left. 34Then the King will say to those on his right, 'Come, you who are blessed by my Father, inherit the kingdom prepared for youfrom the foundation of the world. 35For I was hungry and you gave me food, I was thirsty and you gave me drink, I was a stranger and you welcomed me, 36 I was naked and you clothed me, I was sick and you visited me, I was in prison and you came to me.' 37Then the righteous will answer him, saying, 'Lord, when did we see you hungry and feed you, or thirsty and give you drink? 38And when did we see you a stranger and welcome you, or naked and clothe you? 39And when did we see you sick or in prison and visit you?' 40And the King will answer them, 'Truly, I say to you, as you did it to one of the least of these my brothers,[a] you did it to me.' 41"Then he will say to those on his left, 'Depart from me, you cursed, into the eternal fire prepared for the devil and his angels. 42For I was hungry and you gave me no food, I was thirsty and you gave me no drink, 43I was a stranger and you did not welcome me, naked and you did not clothe me, sick and in prison and you did not visit me.' 44Then they also will answer, saying, 'Lord, when did we see you hungry or thirsty or a stranger or naked or sick or in prison, and did not minister to you?' 45Then he will answer them, saying, 'Truly, I say to you, as you did not do it to one of the least of these, you did not do it to me.' 46And these will go away into eternal punishment, but the righteous into eternal life." Happy New Year, friends. To the King and His Kingdom. There is a King. Christ Church's Advent Devotional is online! 7 quick takes, Thanksgiving edition! Monday Mix Tape: support artists, buy art! only 18 days 'til Advent! Monday Mix Tape on Tuesday: fall cleaning!